Build a cheap raised bed garden by repurposing used pallet crates. Build raised beds for your garden using garage door panels and fence posts. As soon as the holidays are over, the winter weather finds me daydreaming about the coming spring. I decide which annual flowers I will plant and create my kitchen garden plan including a shopping list. Next I list the foods we like (no point in growing something we can’t or won’t eat) and quantities necessary for preserving the crops. I also grow enough to share with friends. I look over last year’s garden plan and map out what crops will be planted where. This is important as it is necessary to rotate crops and amend your soils every year. Even if you are a container gardener, soils must be new or amended every year. It is a good idea to keep a garden journal to keep track of past garden spacing and note problems if any occurred. If you continue to plant the same plants in the same location in your garden year after year, the soil will become depleted of necessary nutrients. It also can invite diseases. Each season fertilizer or compost is added to the soil and crops are rotated from the previous season. The materials used in our garden bed project should last for many years and the beds are an attractive addition to our garden. I have a raised bed kitchen garden area my husband and I built. Although I love gardening, I’m not fond of the maintenance and back aches. In the past I have made raised garden beds from wood, which looked unsightly after a season or two and were expensive to construct. I wanted an inexpensive and attractive alternative to build my raised beds. One day, as I sat on my front step thinking about this project, I noticed the raised panels on my neighbor’s garage door. Suddenly I realized I could make raised beds from garage door panels. My husband and I received free, slightly used garage door panels and struts from our local garage door company. We purchased resin reinforced vinyl fence posts and finials at a home improvement store. Hardware was found in the vinyl fencing section to attach the panels to the posts. My husband cut the door panels with a jigsaw to the length and width needed for each bed. Two struts were attached, one at the upper section and one on the lower section of each panel for strength. He cut each fence post to a length just above the panel height and added the finials. After attaching the panels to the posts with the fencing hardware, we added heavy-duty commercial pond liner to direct the drainage to the center of the bed. This also keeps water from seeping out under the sides of the beds. The liner leaves about a 5-inch wide by 3/4 the length (of the bed) opening in the center of the bed floor area. We then placed the beds on a layer of rock and filled the beds with garden soil. We used a station of our sprinkling system to add automatic watering for the beds. A valve is located on each bed so the water can be turned off each bed separately. Liberty Generator was created as a remedy to the problem of huge electricity bills that are constantly increasing even higher. There was a need to discover a cost efficient way that we can use to power our houses and be energy independent that would not cost a whole lot of money and that would not be difficult to build.Lets look this infographic. I cover the top of the beds with plastic for some crops such as tomatoes, cutting a hole to plant each tomato start. This eliminates weeds and keeps animals from digging in the beds. We built these garden beds years ago and they still look great. This kind of raised garden bed is ideal for those gardens that don’t have proper space. We’re making progress on Operation Backyard. Just to remind us … here was our plan. First, put in a fence to block off the alley from the pooch. We love her but know that she won’t be able to resist digging in all that fresh smelly dirt. Check. The fence is in.Next build the garden beds along the fence. First we rototilled the heck out of the lawn. It was my job to rake and excavate. Bo-ring! Next we laid out and leveled the beds. (I have decided that levels are a huge pain-in-the-arse.) Here we’ve got the beds quickly tacked together after having assembled them, decided they weren’t leveled respective to the fence, disassembled ’em, excavated some more, and then reassembled all over again. By this time I drank 49 diet root beers and cursed Jack in 3 languages. These beds total 43’x3′. (That’s a lot of bedding to assemble, disassemble and reassemble. Not complaining, just sayin’.) The inside bed is 12-inches tall wrapped by a bed that is 6-inches tall. We decided to use untreated rough cut redwood. It happens to match all the new fencing that we’ve put around the property as well. Everything is screwed together and every joint is bracketed with galvanized corner thingamabobs. These beds aren’t moving. The beds were then lined with weed cloth and then filled with a terrific composted garden bed soil from one of our local landscaping companies. We ended up using 3 yards of dirt. Finally, our finished beds with a couple of herbs transplanted from the other side of our house. The seeds and other starters will go in this week. We’re pretty happy with the tiered bed design and how it turned out. Jack designed it so that there was practically zero lumber waste and along with some other economies we were able to get it done within budget. The only thing we would have done differently was to have stained the wood with a nice honey transparent deck stain to give it some finish and increase longevity. But that was an issue of aesthetics and didn’t fit our budget so unfortunately we crossed that off our list in favor of building tomato and strawberry boxes to line our driveway. Other than that, it’s exactly what we wanted. Whew! 43-feet of bedding. That’ll keep me busy for the next few months. Next up: the driveway tomato and strawberry boxes. Then the left side of the alley—Jack’s fern/hosta garden bonanza. 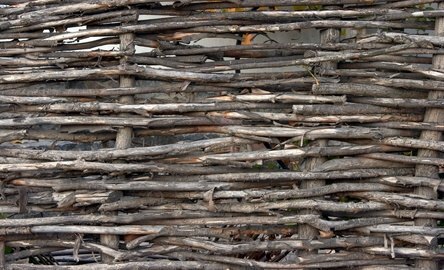 Here’s simple project where branches are woven around stakes to create a pretty and durable border for a raised garden bed. One of the oldest methods of fencing is a woven-stick fencing method called wattle fencing. Archaeological evidence indicates that bent- and woven-stick fencing was in use in the Roman Empire from England to Italy. Wattle fencing is simple to make using a flexible wood such as willow. Willow branches that have been pruned from a tree are a good source for fencing material. Mark the ends of the location of your future fence by driving wooden stakes with a wooden mallet into the ground in the location where you want the ends of the fence. Tie a string between the two stakes. Stretch the string tight to mark the fence row.Measure the length of the fence row. Decide how far apart you wish to space the upright posts of your fence. This will help you determine how many fence uprights you should make. For example, if you want to create a 12-foot section of fence with uprights spaced every two feet, you should create seven uprights.Mark the location of each fence post along the fence row by dusting the ground in that spot with baker's flour. Baker's flour will rinse away with water and is more biodegradable than spray paint.Measure the height that you want the fence to be. Add 24 inches to this height; this will be the size that you make your upright fence posts. For example, if your fence will be three feet tall, your upright posts should be 60 inches tall.Cut the upright fence posts from pruned willow tree branches that are between two and six inches in diameter using a hand saw. Turn Back the Clock 150 Years: The Lost Ways is an amazing program created to find out how our grand parents has survived in their crisis and they make us to learn the little secrets that helped them to survive in spite of almost everyone else dying. Now this is your chance to be part of saving our ancestors’ lost ways. Just I hope that there are more people like you and me who deeply believe that the best way to survive the next major crisis to look back at how people did things 150 years ago….Download this wonderful book. Sharpen one end of each post so that it will easily drive into the ground. Remove any sprouting limbs from the fence posts with branch loppers. Leave the bark on the posts for a rustic appearance.Drive each post into the ground point-side down. Each post should extend down into the ground 24 inches deep at the points along the fence row that you have marked with flour.Cut long, pendulous willow branches that are approximately one inch in diameter to create the horizontal fence strands using branch loppers. Each branch that you select for the fence strand should be at least 24 inches long.Trim twigs and leaves off of the branches that you use for your horizontal fencing strands. Put the branches in a bucket filled with water for two hours to make them more supple.Take a horizontal branch and weave it back and forth between the upright fence posts, leaving three to four inches protruding past the first post. Pass the horizontal strand in front of one fence post and behind the next post in the row in a basket weave pattern. Continue to weave strands between the posts until you finish a complete row of fencing. Leave three to four inches protruding past the last post.Weave a second row of willow branches on top of the first one so that the weave pattern moves the opposite direction from the first strand. Continue to weave the strands between the posts until the strands cover the upright posts all the way to the top of the fence.Weave small branches in between any gaps and cut the protruding branches at the end posts to one inch. Make a natural looking raised garden by using free, natural materials such as small branches, a few thicker logs and some straight timber sections. The result is stunning! Once this level is set, cut all of the posts to this string level height.The next step will be to notch each post so that the beams will be able to sit onto something. Using the level line, calculate how deep the notch will be. This will usually be the size of timber beams you are using. In this example I have used a 100 x 50mm timber section, therefore cut down 100mm and into the post 50mm from the front of the post. Cut out with a saw as level as possible. Sit the beams on the notches and prepare to fix to the posts.With the beams in place, drill holes and screw beams to the posts. Ensure that the screw is long enough to go through both. Countersink holes if you like. If you have any corners, these may want to be mitred, however these sort of decisions are up to you. Following the first run with the branches and once they are reasonably firm in their positions, start to trim the branches flush with the top of the timber beams. After a few cuts you will find that some branches are wobbly. If this is the case, you will need to keep squashing in appropriatly sized brances until this wobbling ceases. After a while you will notice that the wall is so dense that no gaps are apparent when looking through the front of the wall. If it is difficult to add new branches, use a hammer to smack the branches into position. Basically, if all of the branches are firm, you will have no structural problems in the future.By the time all of the branches are cut and each branch does not wobble, the wall should be about 4-5 rows deep - enough to hold soil back from falling through the front. I use old tires in my garden. We cut the side walls out and fill them with soil and they work great. We used big old tractor tires for the big stuff like watermelons and cantaloupes. We even planted an asparagus bed in one and they’re doing amazing. Each car tire gets one tomato plant or pepper plant, 6-7 okra plants planted in a circle or green beans with wooden tipis to grow up. The tires were free, the cutting was tedious but well worth it. And 5 years of soil samples have shown no contamination from the rubber.